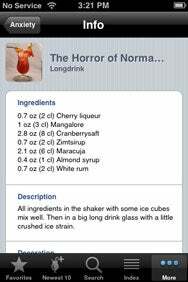 I eventually came up with a potent mix of three rums, two liqueurs and about five different fruit juices—sort of a variation on the Zombie—which was successful, but probably not original. Looking back, though, I wish I had my iPhone and access to one of the cocktail apps I’ve come to enjoy and rely upon in such occasions. I did a round up of drink recipe applications for the iPhone and iPod Touch in August. A couple more cocktail apps have since appeared in the App Store, and a couple of the apps I reviewed ago have released major updates. So back to the bar we go! I Second That Emotion: Feeling anxious? Then use Cocktails App’s ability to search for drinks by emotion to whip yourself up a Horror of Normandy. Swiss Development’s Cocktails App—not to be confused with Skorpiostech’s Cocktails, which I revisit below—is based on a fascinating German lifestyle site called Cocktail Dreams. I noticed the application when I was assembling the first round-up, but as it was available only in German, I declined to review it. It makes him like the B-52, then vanilla until chocolate liqueur into the glass so that they are as little confused. Then the rum as a small shift to specify that float. To drink: light rum, deep breath, Strohalm immediately into the glass and drink! Got all that? Gott segnen sie! Cocktails App is similar to other apps of its kind as far as user interface goes. You can view the complete A-Z list of more than 2,000 drinks, or view the top 10 and 10 latest cocktails from Cocktail Dreams. The app’s search engine lets you search by ingredient, cocktail name, or even brand name, and helpfully lists drinks by flavor. You can also add drinks to a list of favorites. Each recipe includes a “more details” button that launches the device’s browser and takes you to the Cocktail Dreams site. But unless your German is better than mine, this feature will be of little use. Also, be aware that all of the recipes are converted from centiliters to ounces, which makes for some strange measurements (4.9 ounces here, 0.7 ounces there, etc.). And many of the recipes call for ingredients unavailable in the United States. Cocktails App is different from other drink recipe apps insofar as it requires a Wi-Fi or 3G connection to run. That keeps the app size small, but I don’t find that such a great selling point. The app is slow to load its database, which is leaden with images. Although it’s nice to see what a drink should look like, the feature is entirely superfluous. Besides, the app doesn’t even have a picture for every drink. Cocktails App deserves plaudits for incorporating a landscape view and for its skewed creative sensibility. Any app that lists “funky,” “very cute,” “very angry,” and “interesting” as flavors has something going for it. The app also lets you search for drinks by “emotion,” including “anxiety,” “cool,” “hopeful,” “eagerly,” and “furious,” (Maybe “very angry” was so furious with “furious,” it refused to be contained in its section?) This is a great idea—in the vein of “something spectacular”—and I hope the developers refine it along with their translations in future updates. For now, though, I’d pass. Drinks For Everyone: In addition to cocktails, 5800+ Drink & Cocktail Recipes Free has information on other types of beverages as well. The cumbersome name of Webworks and Applications’ app tells you just about everything you need to know. It’s a big drink recipe app and it’s free—which, in this case, means ads at the top of the screen. Launch 5800+ Drink&Cocktail Recipes Free, and after viewing a welcome screen with an image of a rather unappetizing green drink, you land on the favorite’s page, which comes loaded with such nightclub favorites as the Cosmopolitan and the Lemon Drop. You can view the entire list of 5,800 drinks, aided by an A-Z scroll on the right side of the screen, or search by drink category. 5,800 Drinks is unique because it includes not just cocktails, but wine, beer, cocoa, coffee and tea, milkshakes and floats, punches, and soft drinks. 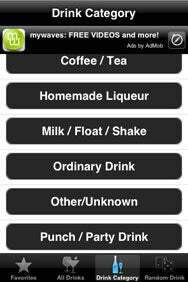 The app even has a few odd categories: homemade liqueurs, which consist primarily of infusions; “ordinary drink,” which includes un-ordinary sounding concoctions such as the Nappy Dugout, Nasty Pablo and National Aquarium; and the mysterious “other/unknown” category of drinks, which features several perfectly unmysterious absinthe drinks. For the adventurous imbiber seeking “something spectacular,” or just something different, 5,800 Drinks has a “random drink” button on the right side of menu bar. Don’t like the result? Tap the Random! button at the top left of the screen. With so many drinks to choose from, you shouldn’t have trouble finding something to your taste. That said, I didn’t particularly care for 5,800 Drinks’ interface. The black, grey, and white color scheme is dingy and hard to read. The type is small and you cannot adjust it. All of the recipes include a check-off box next to each ingredient, a space-consuming feature that adds little value to anyone except those with extreme attention-deficit disorder. In all, 5,800 Drinks’ virtue is quantity over quality. The Cutting Edge of Cocktails: Skorpiostech’s Cocktails offers a focus on contemporary cocktails, which helps set it apart from other apps. Although still lacking notes or an editing function, Skorpiostech has refined Cocktails’s interface and greatly improved the app’s stability. Crashes are now few and far between. And if a drink has more than one historical recipe, the app will list the contemporary version first instead of forcing you to flip through older recipes first. Another valuable improvement over the first version is the addition of “cutting edge drinks from esteemed mixologists.” So far, this consists mostly of recipes by Jamie Boudreau, the leading evangelist of the “molecular mixology” movement. I’m cool to some of the more outlandish cocktails, which barely qualify as drinks at all. 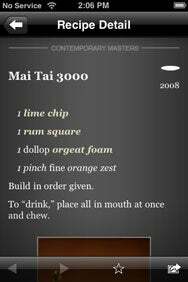 (See the Mai Tai 3000, for example.) But the focus on “contemporary classics” is a welcome one, and sets Cocktails apart from its competitors. Cocktails also now lets you share what you’re drinking via Twitter. But you need Twitterific installed on your mobile device for the feature to work. Surprise Me: The much-improved Drinks sports a clever random drink selector. Drinks, formerly iDrink, has also refined its interface and improved several features. The lengthy favorites list is a compilation of the 65 most popular and common cocktails. You can search drinks by liquor base, mixer or garnish. And a clever random drink selector that looks a bit like a slot machine serves up some interesting suggestions. Drinks’ strongest feature remains its virtually unlimited capacity for customization. I still don’t like many of Drinks’ built-in recipes, such as the non-traditional Singapore Sling and the Mai Tai, but now I can easily delete and add the correct ingredients and portion sizes. Problem solved. Cocktails remains my favorite for its loving attention to history, but Drinks’ steady improvement and emphasis on customization has won my respect and earned the app a coveted place on my phone’s home page. The applications are compatible with any iPhone or iPod touch running the iPhone 2.x software update.